What makes a gaming mouse perfect for you? Of course, you want a mouse that is the right sensitivity for your needs and one that will allow you to move and respond quickly in games. Even the weight of the mouse matters and comes down to personal preferences. Some gamers like heavy mice with a weighty feel. Others enjoy a lighter one that zips along the desk. Unfortunately, you can’t touch an optical mouse before you buy it online, so how can you know if it’s the right weight and sensitivity for you? With the aLLreLi T29 USB 7 Buttons Professional Gaming Optical Mouse, you don’t have to worry. Our professional gaming mouse has a universal, flexible design that suits everyone! 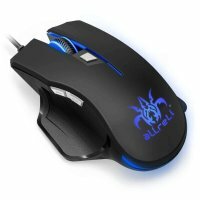 The aLLreLi T29 Professional Gaming Optical Mouse is a revolutionary wired mouse that can suit any gamers. You can choose from four DPI settings using the convenient button and make the optical mouse as sensitive as you wish. As you cycle through the settings, different LED light colors will shine, so you’ll always know what level you’re at. To address the issue of weight, we added a counterweight to the aLLreLi T29 Professional Gaming Optical Mouse. Add and remove weights to make the gaming mouse as light or heavy as you wish. The ergonomic design ensures absolute comfort through the longest of gaming sessions. With the aLLreLi T29 Professional Gaming Optical Mouse, you’ll be able to do more in the game at a faster pace. Our wired mouse has a Fire key that lets you perform important functions rapidly. To ensure that signals are sent from the unit as efficiently as possible, the programmable gaming mouse has a nylon braided cable with an anti-interference magnet ring. Compatible with Windows XP / Vista / Windows 7 / 8 / 10 / Mac OS and other systems, the aLLreLi T29 USB 7 Buttons Professional Gaming Optical Mouse will change the way you game for the better! Experience it for yourself. Most of the mice I have have the right key disabled with frequent use. Does this mouse hold the click so hard that it does not have any crashes for the left or right keys with frequent use, is there some wall to Holds or decreases the power of the click on the key ?